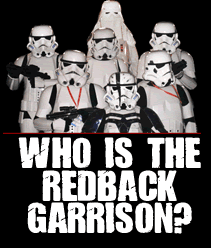 Redback Garrison » Blog Archive » Fallen Trooper. May 20, 2010Posted by Moxxxie Comments Off on Fallen Trooper. It is with great sadness and regret that the Legion reports the loss of Sudeshen “Suds” Naiker (TK-6016) of the 501st Southern Cross Garrison. Suds passed away this past weekend after a long battle with kidney failure. His last days were spent in the hospital—in armor—entertaining hospitalized children and adult patients. Despite his short time as a member, Suds well-represented the ideals of the 501st Legion. This entry was posted on Thursday, May 20th, 2010 at 6:44 pm	and is filed under Garrison News. You can follow any responses to this entry through the RSS 2.0 feed. Both comments and pings are currently closed.